**I received an advanced reading copy for review. All thoughts are my own. Most of us have heard this verse before, haven't we? I know I certainly recall hearing it time and time again in church growing up. It was a powerful message...God's grace required nothing from us. It was unconditional, freely given. What an amazing gift to have been given. But in this society where nothing is free, do we really believe that? If so, then why is there this constant desire to BE better, to do more. Often it seems that there is this mindset that believing in God perhaps is not enough. We need to do MORE. We need to be more involved. We need to give more time, give more money, give more of ourselves. We need to attend more church functions, help more people, do more missions. Not because these are good things to do or things that bring us joy necessarily, but because we fear that we are not being Christian enough. A young idealist heeds the call to radical obedience, gives away all of his belongings and shaking off the fetters of a complacent life, travels halfway around the world. There he discovers, among the poor and the fatherless of West Africa, that he has only surrendered to a new kind of captivity. There is no doubt that young people today are fully invested in social and human rights issues. They start their own nonprofits, they run their own charities, they raise money for worthy causes. Books on saving the world abound, topping the bestsellers’ lists, fueling the drive to prove not only commitment to the world but devotion to God. Now there is a new crop of books starting to emerge, detailing the consequences of trying to save a world that is not ours to save. But none of these books tell the story that Runaway Radical tells; this is the first book to highlight the painful personal consequences of the new radicalism, documenting in heartbreaking detail what happens when a young person becomes entrapped instead of liberated by its call. His radical resolve now shaken, he returns home to rebuild his life and his faith. 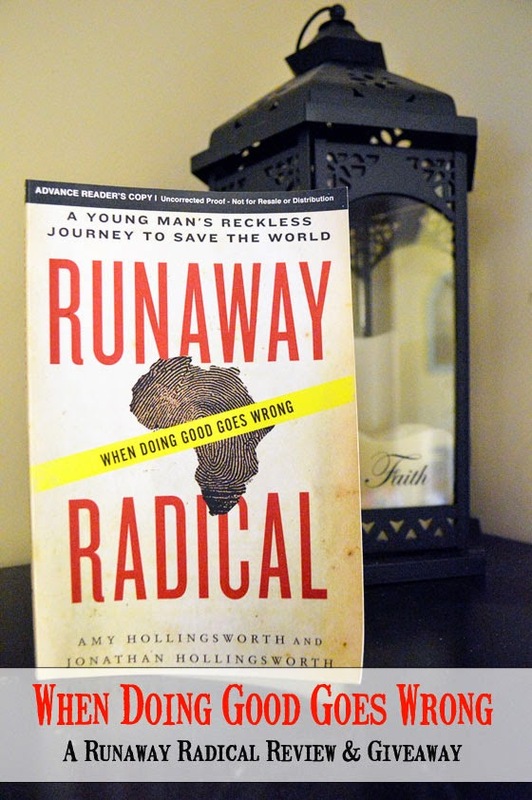 Runaway Radical serves as an important and cautionary tale for all who lead and participate in compassion activism, in the art of doing good— both overseas and at home— amidst this new culture of radical Christian service. After finishing this book, the first word that comes to mind is simply...wow. What a powerful, emotional story. Can you imagine setting out in hopes of saving the world only to see dishonesty and yes, even corruption in the face of the church...the one group that we should be able to trust wholeheartedly. What a blow to our faith. Where would you go? Where would you turn? How confusing would your world become. This was the reality for Jonathan, a boy once full of dreams of saving the world, left shattered by a missionary experience to Africa that turned out to be nothing as he expected. The book tells the tale in narratives by both Jonathan and his mother Amy. Jonathan's firsthand accounts of the events that took place were powerful to read, but as a mother I found myself feeling deeply moved by Amy's accounts as well. I could put myself into her shoes and imagine how I would feel if this were my son living this experience. How helpless it would feel, and how difficult to see your child's dreams turned upside down. I do not want to tell too much of the story, but it was certainly a powerful story that was worth reading. It was a great reminder that this radical movement to be a better Christian by doing more good was not what God has asked of us. It is not a tale to say not to do good, or not to go on mission trips, but to give us a different perspective on which to think about them. It is a reminder that if we choose to do these things, it should be because we want to, not in an effort to be a better Christian...because God's grace is unconditional. Runaway Radical will be available on February 24, but you can preorder now at Family Christian! I would like to get the Veggie Tales Noah Ark video so I can watch it with my grandsons.